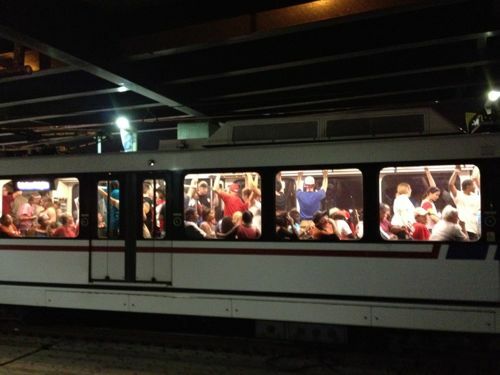 Tomorrow is an important day for transit in St. Louis. 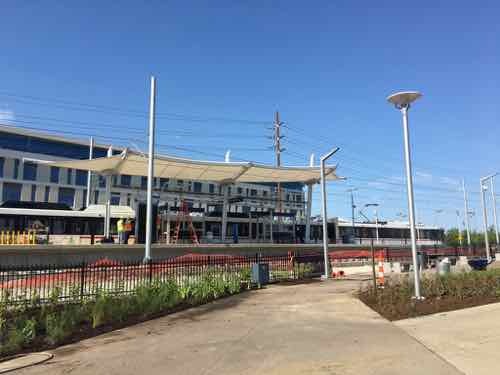 At 10am Tuesday 7/31, 2018 a new MetroLink station will open along the original segment. The original light rail alignment opened 25 years earlier on July 31, 1993. I was 26 and a huge supporter of rail transit, but I didn’t live or work anywhere near amy of the stations. At the time I lived in Old North St. Louis, a year later I bought a 2-family in Dutchtown. I was working in Rock Hill. MO. 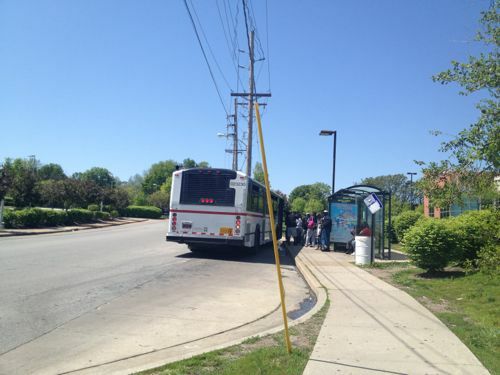 MetroBus picking up riders at the Wellston MetroLink station– taking them to their final destination. 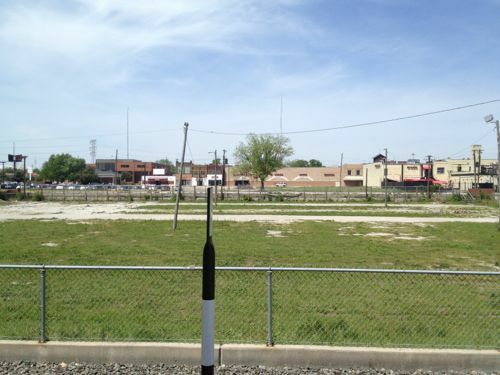 The Wellston Station still lacks any transit-orioented development (TOD). As a result of where I lived & worked, light rail wasn’t of any use to me. Switching jobs from Rock Hill to North St. Louis to Kirkwood didn’t change the lack of usefulness to me. However, I do recall a few times I’d catch the bud to take MetroLink to the airport for a rare trip. It wasn’t until after moving downtown, and my February 2008 stroke a few months later, that I really began to use our public transit system on a regular basis. In the last decade I’ve traveled far more miles on MetroBus than via light rail. 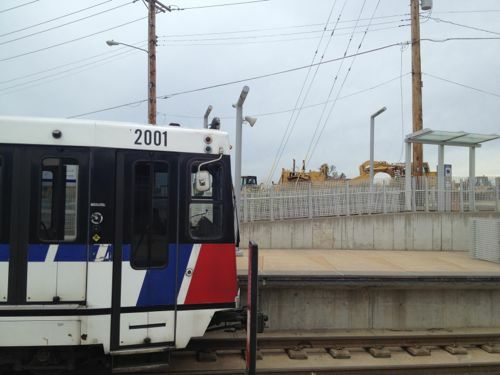 Trips involving light rail almost always involve a MetroBus on one end, or both. 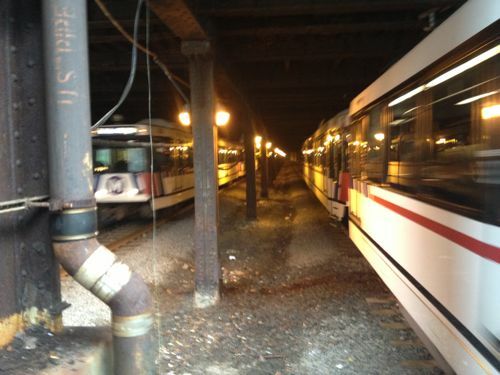 MetroLink trains travel in a short tunnel under the historic Union Station train shed. The St. Louis region only a little bit of heavy rail commuter lines to places like Jennings & Ferguson, Webster Groves, Kirkwood, etc. Light rail in the form of streetcars was the primary type of rail transit in the St, Louis region. A line even connoted Illinois into downtown St. Louis, coming in under Tucker Blvd. Prior to WWII the bus began to replace streetcar lines — it was smoother and quieter than the old streetcars. The final streetcar line ended in May 1966. So when modern rail transit was being conceived in the 1980s the choices of right-of-way was limited. 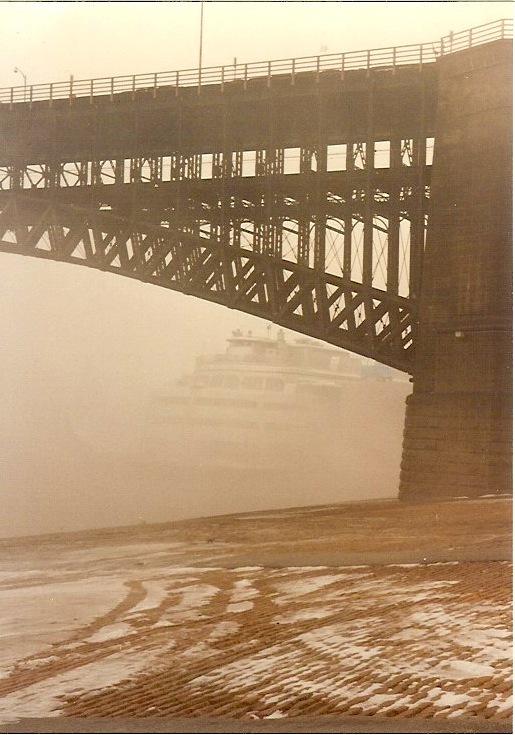 In 1989, as part of the work on light rail the City of St. Louis traded bridges with the Terminal Railroad Association. The TRA got ownership of the MacArthur Bridge and the city got the Eads Bridge and tunnel under downtown’s central business district. Rail use of the Eads/tunnel ended in 1974 because then-new locomotives couldn’t navigate the bridge or tunnel. New light rail vehicles, however, would fit nicely. This was an excellent use of right-of-way and a great way to cross the Mississippi River. ABOVE: The view to the west of the Sunnen MetroLink station in Maplewood is radically different now, just bare earth. 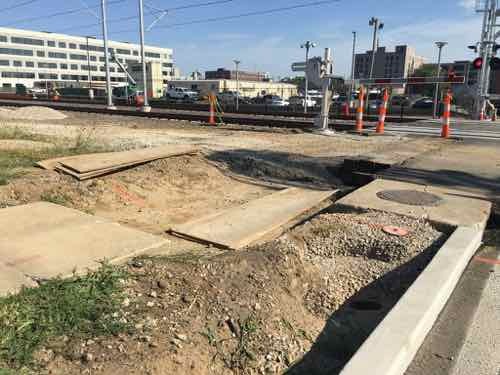 An old freight corridor was acquired that would take the original alignment from downtown St. Louis through numerous municipalities in St. Louis County toward the airport. 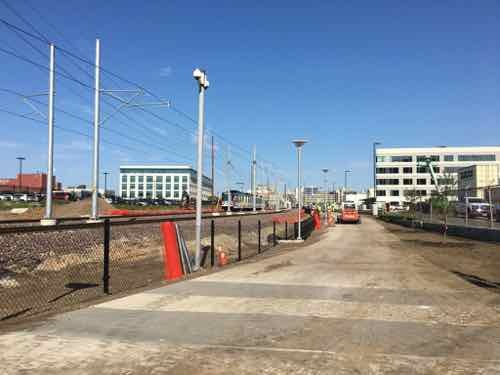 On opening day trains didn’t reach the airport terminals, it stopped at the Hanley Station. The main terminal was opened soon after. The East Terminal (#2) station came years later. The only structure at North Hanley is a parking garage, added years after the station opened. Extensions were made in St. Clair County, IL and in 2006 a Missouri extension to Shrewsbury via Clayton. 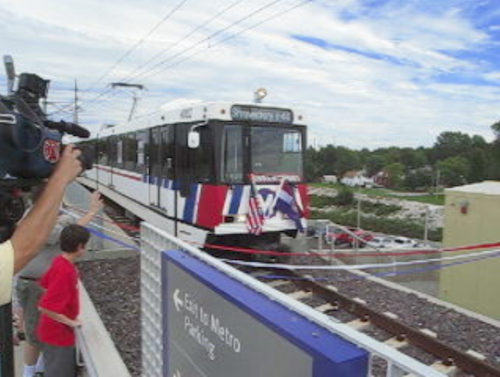 The Shrewsbury MetroLink station opened with the blue line extension on August 26, 2006. The Blue Line to Shrewsbury was costly as many residents along the alignment wanted the trains underground rather than at grade. The line was built to continue South from Shrewsbury, but nearly 12 years later that seems like a non-starter. In the 25 years since the original line (Red) opened, and nearly 12 years since the Shrewsbury line (Blue) opened, we’ve not seen any transit-oriented development around the stations. We’ve had some transit-adjacent development, but mostly nothing. This is because smart land use planning wasn’t implemented at each station prior to construction. Development around the Maplewood station on the Blue line has been a lot of new car dealerships. Tomorrow morning service will begin at the new CORTEX station located between Grand and Central West End (BJC). 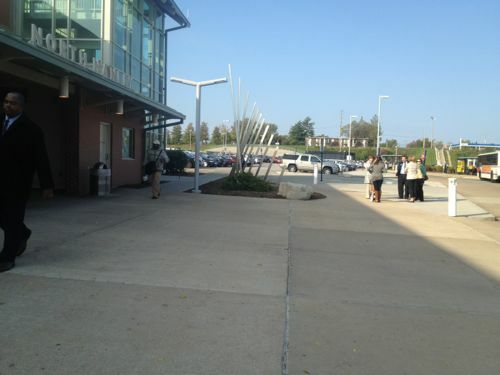 The CORTEX district tries to market itself as pedestrian-friendly. Compared to most of the St. Louis region, it’s a pedestrian’s paradise. For this pedestrian, however, it’s a typical mediocre attempt at best. Sidewalks are narrow, surface parking lots face rail line, the original CORTEX building still lacks an ADA-compliant accessible route. Ribbon cutting for the new station begins at 10am, I’ll be there, weather permitting. The new station can be tracked from Boyle Ave on the West, or Sarah Street on the East end, though it’s closer to Boyle. Those using Boyle from the North or South will have no problems tomorrow. Same for those using Sarah from the North. As of Thursday last week, those trying to enter/exit the station from/to South Sarah will have ro use the street. A wide sidewalk runs along the North side of the tracks between Sarah & Boyle, looking West from Sarah Street. An Eastbound train is seen passing by the station last week. We’ve invested a lot in light rail, but we’ve not always been smart about it. We’ve not leveraged it to created dense walkable nodes around stations. Going back after the fact is proving just as hard, if not harder, than if it had been done 25 years ago.